These cookies should not look all flattened out. I suppose in years past I probably chilled the dough first, so they did not spread so. This is the first entry in my Christmas baking. 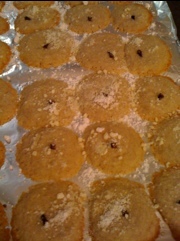 Normally I go crazy with making the family traditional cookies. We have a bizarre assortment of cookies we make. Bizarre because there are lots of ethnic cookies like these Greek kourabiedies which make no sense for our family since we are not Greek. Gotta ask mom how this recipe made it’s way into our holiday traditions. It’s a simple dough: 1/2 cup butter, 1/2 cup sugar, 1/2 tsp. ground cloves, 1.25 cups of flour, and an egg yolk. Work it all into a dough with your paws, roll into balls, stick a clove in each, bake at 350 then dust with powdered sugar. And it normally stays in the cure little ball shape. I think I’ll blame humidity for my flat cookies-it’s been raining like crazy here. When I lived in St. Louis I could blame humidity for everything but rarely can one do this in Los Angeles so I better take advantage! stuffed peppers-if anyone can think of a more clever title for this post, i am allllll ears! The recipe: Spinach and Sausage Stuffed Peppers from last October’s Food and Wine. 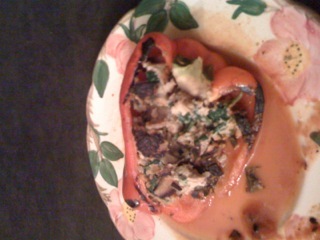 The changes: I halved the recipe,used a red and an orange bell pepper instead of Italian frying peppers(which I can’t say I have EVER seen at the store-anyone know what they are? )used the vegetarian soy Italian Sausages by Lightlife instead of real sausage, almond milk instead of milk, vegetable stock instead of chicken,and since I would have needed one tablespoon of cheese and one of nuts I left them out because I did not want to purchase these items and use so little. The process: saute baby spinach, knead a chopped up piece of bread with some milk and egg, add spinach, some red onion and sausages, stuff halved peppers, saute stuffing side down then stuffing side up then simmer in some tomato sauce and stock. Eat! 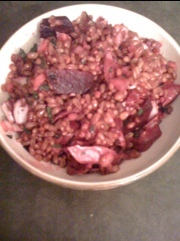 This was from a Bon appetit-a recipe for farro, beet and radicchio salad. My CSA delivery included, among other delights, the radicchio, beets, and red onions I would need. So I ventured to the store for the rest of the ingredients. The recipe said you could sub wheat berries for farro so I did, and I ended up leaving out the feta cheese. So what should I have known? I should have known to leave out the red onion. I like it alright, taste-wise, but cannot abide by the taste it leaves in your mouth for the next 24 hours. This salad could have been terrific but nope, foiled by the onion…however now I know I love the chew of wheat berries! Unfortunately, the BBC stands for Black Bean Cakes, not the TV channel. Fortunately, they are delicious. 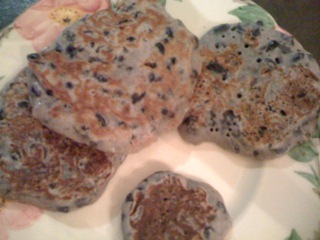 Technically, actually they are griddlecakes. From How to Cook Everything Vegetarian. I am addicted to this book! mash beans slightly, add liquids then dry ingredients, then cook on a griddle or a frying pan. Now, to work on getting some REAL BBC!